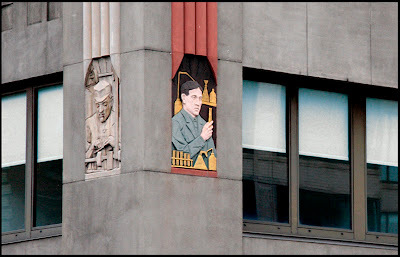 This is a detail shot of the facade of the otherwise nondescript building at 100 Avenue of the Americas. In fact, that full address was also the name of the building, and was painted on the blank south side of it, facing toward Canal Street and the uptown traffic going by. My first job in New York City was in this building. It was the summer of 1978, and my former trade school teacher had told me about the place. I spent a week there, coming into the city after leaving my then-current job, and working a part-time night shift. It lasted a week before I realized I didn't want the job; it would be six years before I saw the building again, when I started at a job on Hudson Street in 1984. I shot the first picture with a zoom lens from across 6 Avenue. I'd noticed the guy in the window, and was waiting for him to face in a good direction. Having him on the phone added a nice touch as well. And after all these years I still look at this picture and wonder if he isn't someone I eventually wound up working with. 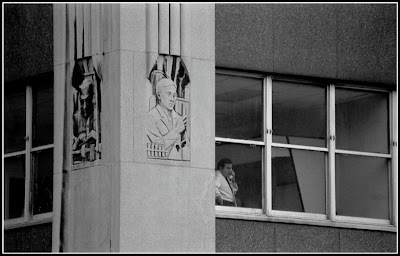 The bas relief had been painted over, I knew, sometime in the mid 1990's, and rather nicely I think. I don't know why the relief facing Watt Street was left alone though. Or why, in a building filled with printers, there were trades like chemists and, well, I'm not too sure what the other fellow is doing, but apparently the tenancy of the building was more varied when it was completed in 1930. Is he weighing something, or is he a cobbler? Hard to say, but if you've got any ideas, feel free to leave them in the comments section at the bottom of this article. Other building upgrades from around the same time include new windows, which obviously don't include any unwitting posers early on Sunday mornings. and I like the one left unpainted. It lets you have your cake and. I also like the bold san-serif you're using for the text..Don't know what upainted-man's doing, but I think the key is in that object over his head that looks like a small barbell with the ends of the bar sharpened to a point. It looks SO familiar, but I can't place it. I passed this building today and was interested in its history, which is how I came across these pictures online. I belive the painted image depicts someone involved in knitting.